by Mark Loveys (co-founder and original developer of Exonet), August 2009 (C) Copyright 2009, Mark Loveys, all rights reserved. It is fair to say that I have been deeply involved in Exonet (a.k.a. 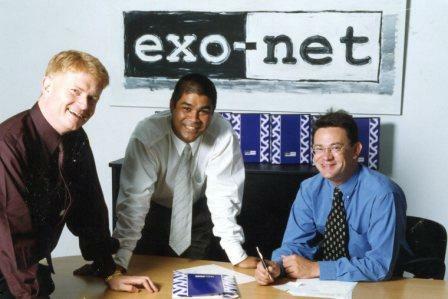 exo-net, Exonet6 and MYOB Exo), since the day I cut the first line of its source code back in 1997, through to today, in my role as CEO of Enprise Solutions, New Zealand’s leading MYOB Exo / EXONET sales, support and development partner. In 1984 I secured my first full-time job at Philips New Zealand (based in Mt Eden, Auckland), in the Lighting Design department of their Lighting Division. I had just completed a 3 year Bachelor of Science degree at Auckland University, majoring in Electronic Physics. In my final year I had taken a couple of computer programming papers that were based on the UCSD Pascal and PDP-11 assembler programming languages. Soon after I’d started at Philips, a new Philips PC computer turned up at our office. It was sent from Philips’ head office and I understand that at that time, all Philips branches around the world received one also. Philips was getting in to the Personal Computer space and expected its staff to be early adopters in this new and exciting technology. The computer was intended to be a portable, but we referred to it as a “luggable”. It had a small green screen, two floppy drives, very little RAM, no hard drive and a strap that went over your shoulder, for lugging the thing around. MS-DOS had not arrived on the scene at that time, so this machine ran on CP/M. At one stage I was sent to Philips’ head office in Eindhoven, Holland, to attend their advanced lighting design course. That was a great experience and I very much enjoyed getting to know the other participants from various parts of the world who all had similar jobs to me. I declined their offer – mainly because my band Satellite Spies was enjoying a surge in popularity back in New Zealand and was about to be the support act for Dire Straits on their New Zealand Concert Tour for “Brothers in Arms”. There was no way I wanted to miss out on that! Upon my return to Philips New Zealand, I was promoted from the Lighting Design department to become Product Manager for “Architectural Luminaires”. This new job involved (amongst many other things) responsibility for managing the inventory levels of hundreds of stock items. In no time at all I realised that this was mainly a mathematical task (again) and that it was better handled by a computer program. I promptly developed an inventory management system that did this part of my job for me. Soon I had plenty of time on my hands for other work – like writing more computer programs for other parts of the Philips business and its suppliers. At that time (early 1986) my band Satellite Spies had a hit record (“Destiny in Motion”) and become quite popular in New Zealand. This made me want to get out and start touring the countryside and making the most of Satellite Spies’ popularity. I therefore regrettably had to resign from my job at Philips. From there things evolved… My day job (computer programming) got busier and busier. Eventually I realised that I was making a lot more money from programming that I was from my music. The software business was obviously a lot better at supporting my young family than music, so eventually I became a full-time programmer. I called my business “Orbit Computers” as a play on the theme of my band “Satellite Spies”. I advertised Orbit Accounts in the business section of the New Zealand Herald and used to sell two to three copies of the program per week. This was enough to keep me in business in those days. Often I would receive enquiries from larger companies that needed something more substantial than Orbit Accounts, so I teamed up with a local software company called “CashLink” that sold a more advanced accounting program called “CashLink Accounts”. In late 1988 I became a CashLink reseller, selling CashLink Accounts to my larger customers and I started learning a lot about the accounting software industry from them. Their New Zealand manager was a young Welsh guy called Sam Lewis-Roberts who went on to become a good friend and later took on an important product management and design role in the Exonet business. The owners of CashLink were father and son team, Bruce and Peter Garden and Peter’s wife Rachel. I cannot state enough how much I learnt from CashLink and its people. Many commentators have observed over the years, the influence of CashLink on my design of accounting software products. In 1989 I licensed Orbit Accounts to CashLink to distribute in New Zealand through their dealer channel. I meanwhile started writing two new products. The first was a Point of Sale module for CashLink Accounts and the second was my next SME Accounting package called “OCL Business System” which was multi-user and also written in Turbo Pascal for MS-DOS. OCL was developed for larger companies than Orbit Accounts, but unlike CashLink, it was modular, so that each individual accounting module could be sold on its own, or as part of an integrated solution. I developed the OCL Business System module by module, starting with the Debtors Ledger and then moving on to the Creditors Ledger, Point of Sale, Stock Ledger and General Ledger. This continued on to a Sales Order module, a Purchase Order module and eventually a Job Costing Module. OCL was a lot more complex than Orbit Accounts due to being multi-user, modular and the fact that it retained full transaction history – all without the use of a third party database. All data was stored in binary data files and accessed by linked-lists and transaction linking. OCL was a sales success and generated a level of income that enabled me to start hiring staff, a commercial office and generally expanding the business. The first person I hired was my sister Sarah Loveys, who had just returned from a large overseas adventure. The next person was programmer Lita Teng, who had recently graduated from Waikato University. It’s interesting to note that both Sarah and Lita are still working with me today, so many years later at Enprise Solutions. Sometime in mid 1989, Bruce Garden of CashLink introduced me to a friend of his called Maurice Bryham, who was starting up a new computer company called “PC Direct” and was interested in using CashLink Accounts together with my new Point of Sale module. The day I first visited PC Direct, Maurice Bryham and his business partner Sharon Hunter were preparing to open their Ponsonby based showroom to the public for the first time. Maurice required some modifications to be done to my Point of Sale program, which I agreed to do free of charge. I was impressed with what Maurice and Sharon were setting up and wanted them to be a reseller of my Point of Sale module, along with CashLink Accounts (at that stage they were intending to be a CashLink reseller). PC Direct opened for business selling PCs & software and went live straight away on their CashLink Accounts system, with my Point of Sale module recording sales from a PC on their front counter. A year passed and I didn’t hear anything much from PC Direct. I was disappointed that they only sold one copy of my CashLink Point of Sale software, so was not sure how to take it when Maurice phoned me and asked me to come in to discuss PC Direct’s further software requirements. So in 1990, when I went in to meet with Maurice, I was amazed at how much PC Direct had grown in the year since I had last been there. There seemed to be staff and computers everywhere! Maurice said he wanted a fully integrated custom application written for PC Direct that would grow with the business and capture all information about customers, computers and support issues etc. There began what was to be a long relationship between myself and PC Direct. I used to go in to PC Direct’s premises regularly and spend between one and two days per week on-site developing and enhancing a heavily customised version of OCL that we called “DirectLink” (Later after a complaint about the name by the National Bank, we renamed it to “DirectVision”. In fact we used the name DirectLink before the bank did – obviously a play on the names PC Direct and CashLink, if you ask me). PC Direct is a big subject on its own, so I’ll just stick to the information that relates to Exonet. I met a lot of great people at PC Direct, many of whom went on to work with me in my later businesses, including Exonet, Datasquirt and Enprise. These people include (in no particular order); Steve Southon, Rowan Schaaf, Elliot Cooper, David McKee-Wright, Jason Langley, Matt Sealy, to name a few – plus of course Maurice himself. In 1995, after five years of PC Direct growing and getting up to over 100 users on the heavily customized MS-DOS based OCL program “DirectLink”, the system was starting to groan under the strain. That’s when Maurice and David McKee-Wright (then Financial Controller) asked me if I would work for PC Direct full-time and develop them a brand new in-house system using the latest Microsoft Windows and Microsoft SQL technologies. The only snag in this plan was that I owned a business (Orbit Computers) and had a hundred or so other customers to look after. PC Direct’s answer to this was to acquire Orbit Computers from me, including all customers and staff and set it up as a division of PC Direct, while I became PC Direct’s IS Manager and got started with PC Direct’s new development team in developing the Windows & SQL based “DirectVision”. The DirectVision project started off written in Borland’s brand new Windows Software Development System called “Delphi” (version 1) which used Pascal (my language) as it’s core language. Later versions of Delphi were used as they become available. The database was originally going to be Microsoft SQL Server, but unfortunately back then, version 6.0 was not stable enough for this type of heavy duty application, so I chose Borland’s Interbase instead (which was conveniently shipped with Delphi). It should be noted that later versions of Microsoft SQL Server were vastly superior and of course Exonet was eventually written to prefer Microsoft SQL over Interbase. DirectVision covered a wide range of functionality for PC Direct, including; Point of Sale, Manufacturing, Sales Orders and Order Tracking, Purchasing, Inventory Management, Debtors and Creditors, General Ledger, Technical Support (PC Direct had award winning support service as one of its main differentiators), RMA, Cheque Printing, Banking, Shipping and one of New Zealand’s first e-commerce web sites (which was very successful in selling end of line and returned stock). At the time of finishing up with PC Direct in 1988, I owned a company called “Exonet Systems Limited”, which was in fact my old “Orbit Computers Limited” company that had been renamed. The renaming was required after PC Direct bought the Orbit Business and name off me as a going concern, but not the company itself. I went through a process using Internet Searches to find or construct a name that had not been used before, yet sounded like a modern software company. Exonet was the result of joining “EXO” and “NET” together. “Exo” was probably influenced by the Gulf War of the time and the use of “Exocet” Missiles… (X was also an abreviation of transaction). In “Exonet” I found what I was looking for – a name that had not been used before and which sounded like a modern software company. Little did I know at that time that later on it would become the name of a popular Australasian accounting system. I wanted Exonet to be successful like PC Direct and I knew that I would need many of the skills and people that PC Direct had. Accordingly I approached Maurice Bryham (who was by now a very wealthy individual after selling PC Direct) and challenged him to repeat his success with me and Exonet. He agreed to be involved, but only if the focus of Exonet was e-commerce web sites, not “boring old accounting software”. I agreed. Maurice and I set to work, establishing the new Exonet business, with a plan that David McKee-Wright (at that stage, PC Direct’s CEO) would join us later once we had a platform to work from. I had my head down coding like a maniac for months on end. The limiting factor was how fast my fingers could type, because I knew what I was doing, based on the DirectVision experience. We were building an e-commerce web site product called “Exonet Easyshop” and that included a back-office accounting system, which was simply known as Exonet. The vision was to create a modern system that was flexible, easily able to be customized and would integrate painlessly with other software products such as Report Writers, Spreadsheets, Data warehousing products and other accounting software. It should also be able to run over the Internet and wide area networks (WANS) and be able to utilize the power of SQL server technology – all with a simple easy-to-use graphical Windows user interface. Our dealers (and more advanced end-users) should be able to write custom reports, customize screens and printouts, add extra fields and logic to the system. This was the type of system I knew that the SME accounting software industry in New Zealand and Australia was waiting for. I re-connected with some of my old customers from Orbit Computers and got a few to agree to run with this new program Exonet, based on their personal trust of me. Mike Shearer of ImagePac / Photostop was Exonet’s first customer. He was based just up the road from us and I spent plenty of my time there. I’m pleased to say that our first site was a success, even though a big part of their system was custom written. Imagepac was a high-volume photo development lab and their Exonet system enabled them to track orders quickly and efficiently through the development process. I enjoyed the fact that bar-code printing and bar-code scanners were involved to make the process as quick and simple as possible. It also seemed very high-tech at the time, which was excellent for Exonet’s purposes. Y2k was approaching, which was fortunate for Exonet, because businesses wanted to modernize their accounting software and Exonet (with its e-commerce capability, Windows interface and SQL Server) was very modern. To highlight and maximize the impact of the Y2k issue, we renamed the product to become “Exonet 2000”, as in the year 2000. Later on, after Y2k had passed and after a major upgrade, we renamed the product to “Exonet 3000”. Even later (but I’m jumping the gun here) when it was owned by Solution 6, it was renamed to “Exonet 6000”. Our next port of call for investment was a new VC on the block called IT Capital. Unlike Direct Capital, IT Capital specialized in IT companies and they were very interested in investing in Exonet. A deal was negotiated where they invested three portions of $500K each, making a total of $1.5M, whereby they ended up owning about 30% of Exonet. Maurice, David and I then owned 20% each, leaving a further 10% to be held in trust for allocating to key staff. Glengarry Wines and Spirits is a major importer, distributor and retailer of wines and spirits, that has branches all over New Zealand. Coincidentally Glengarry’s head office was also located just down the road from Exonet’s first office and Glengarry was also an extremely important customer in the early days (and later evolution) of Exonet. David McKee-Wright had a friend (Sean) that worked at Glengarry’s head office and he informed us that Glengarry was going through a nightmare with the installation of their new ERP system (a large American system called, “JD Edwards – One World”). Things were so bad with the new system that the whole Glengarry business was being put at risk through lack of visibility of their operations and finances. David and I decided to walk down the road and meet with Glengarry’s executive chairman, Jak Jakicevich, to see if we could help them with our very young and new product, Exonet. What we had to offer Jak was our can-do attitude, our flexibility and our ability to customize our own product very quickly. Jak agreed to let us have a go, if the JD Edwards installation was not fixed and operating properly by a specified date. I recall Jak showing us a room down the corridor from his office that was full of JD Edwards consultants working on solving their implementation problems. If I remember correctly, there were about 15 in total…five times the total number of Exonet staff at that time! Our first decision was that the version of Exonet to be supplied to Glengarry would be heavily customized and it would therefore not be the standard version of Exonet that we were by then selling through our Exonet reseller channel. To avoid confusion between our standard Exonet program and this new customized version, we needed a new name. The name “Enprise” was created as a play on the word “Enterprise” and also as a variation on Borland’s temporary name of the day “Inprise”. It sounded good so we used it as the name for Glengarry’s system – “Enprise by Exonet”. Later on in Exonet’s history, the name Enprise was used as the name of the direct sales division within the Exonet business. We agreed on a plan with Glengarry that involved a lot of punishingly hard work (by staff at both Exonet and Glengarry) and the hiring of another Delphi programmer by the name of Fred Yu (who was to become a permanent staff member of Glengarry’s after the go-live). Jak hired a project manager from Wellington to oversee the whole project and ensure that staff within both companies were kept in line. The Glengarry side of the project team (Zane and Phil) set up camp in Exonet’s office to check the program out, piece by piece, as it was written. It was a punishing schedule, but I’m glad to say (on behalf of everyone involved in the project) that it was a complete success, we lived up to our promise to Jak and things got moving again at Glengarry. Since that time, Jak has been Exonet’s biggest (and most valuable) advocate. In fact it was Jak’s endorsement that played a big part in us securing a deal with Australian listed company, Solution 6 to acquire the Exonet business in the year 2000 for no less than AUD$30M. We started hiring staff in a big way… In New Zealand, we hired Steve Rieger to be our New Zealand CEO, in Sydney Dave hired Simon Butler to be our Australian CEO and in Singapore we hired Hwa Lian Tan to be our Singaporean CEO. Simon and Hwa Lian also invested significant sums of money into the business. In New Zealand we hired our old friends & collegues, including Elliot Cooper, Sam Lewis-Roberts, Steve Southon, Rowan Schaaf, Matt Sealy, Ben Bernstone…and the list goes on. We hired a team of developers, including Edwin Das, who to this day remains a senior developer for Exonet at MYOB. Solution 6 was a large Australian, publicly listed, Accounting Software Company that was in the process of buying up smaller software companies. We met them in Sydney while working on a project for St Georges Bank. It’s fair to say that Solution 6 took a strong interest in Exonet. They liked Exonet’s modern technology and image. They saw Exonet as the ideal end-user accounting solution that their accountants using Solution 6 could set up in their clients’ businesses and integrate the data back to their Solution 6 software. They also liked the demonstration that Dave and I gave them, showing how Exonet could operate over the Internet as a 3 tier application, with low bandwidth requirements. Tim Molloy and Graham Mirabito of Solution 6’s M&A team were assigned the job of acquiring Exonet and assimulating it into the Solution 6 environment. A deal was struck for AUD$30M, largely thanks to Simon Butler’s M&A experience in demonstrating the high value of Exonet’s potential – given that sales were ramping upwards in the highly desirable “hockey-stick” pattern. The Exonet business was renamed to Exonet6 (being a division of Solution 6) and a huge investment in R&D (amounting to millions of dollars) was poured into the product to make it easier & quicker to install and to fill out the feature set. The new product’s name was upgraded from Exonet 3000 to Exonet 6000 – all under the Exonet6 banner. At Solution 6 we met our good friend Doug Hanna, who was part of Solution 6’s due diligence team and was running Solution 6 New Zealand by he time we were integrated. Doug is now the owner and CEO of the web site development company, Terabyte. Interestingly, Tim Molloy of Solution 6’s M&A team went on to become the CEO of Exonet for several years after David McKee Wright departed the CEO role. After leaving Exonet / Solution 6, I started up the SMS Text Messaging company Datasquirt in conjunction with Maurice and later on Dave (similar to the start-up pattern of Exonet). We subsequently added another shareholder / director in the form of Aaron Ridgway, who later became Datasquirt’s CEO (and still is to this day). Datasquirt went on to list on the Australian Stock Exchange ASX in late 2007 and today I remain involved with that business as non-executive chairman. Regrettably, Aaron and I parted company with Dave and Maurice early on in Datasquirt’s evolution, due to an argument that arose as part of Dave & Maurice’s take-over of the VC company IT Capital. Today Dave and Maurice operate and mostly own Sealegs, which was formed out of the remains of NZX listed IT Capital. Today Datasquirt is going from strength to strength, with offices around the world and selling its communication solutions to a virtual “who’s who” of global corporations as well as smaller businesses. Kieron Lawson, a very talented software creator, who was the chief architect of Exonet after I departed, is now the CIO and chief architect at Datasquirt. In 2002 I received a phone call from Elliot Cooper at Exonet6 to say that Solution 6 was looking at selling off Exonet6’s direct sales division (called “Enprise”) and that he and sales manager Leanne Graham were interested in buying it. He asked if I was interested in joining them. Enprise was the direct sales division of Exonet that sold directly to larger customers that were too big or too complex for Exonet’s dealer channel to look after. Solution 6 wanted to “purify” its business model and only sell through its channel. I was keen to be involved again, particularly as a shareholder. So Elliot, Leanne and I, in conjunction with Exonet Australia’s former CEO Simon Butler bought Enprise as a management buyout off Solution 6. With that transaction we gained all of the largest Exonet customers in New Zealand, including the likes of Ullrich Alluminium, EFTPOS New Zealand, AberGas and the Appliance Connexion Group. I was elected CEO of Enprise by the founders and I retain that position to this date. Simon and Leanne have since departed the business and Elliot remains with me as CFO. In 2006 we gained Venture Capital funding from TMT Ventures (a division of Direct Capital) and we have added two further divisions to the business. Enprise Software develops add-on solutions for SAP Business One which are sold internationally through our 100-strong global dealer channel. EMS-Cortex develops and sell provisioning control-panel infrastructure software for SaaS hosted service providers and that is also sold internationally. Today my focus for Enprise in New Zealand is to leverage the skills and experience of my team (who largely created Exonet) to give excellent service and support to businesses in New Zealand. We have a dedicated support team, an interactive online support system, a team of developers to tailor solutions to exacting requirements and a consulting team that are second to none in getting it right for customers first time. We presently have offices in Auckland, Hamilton and Christchurch and are well set up to service nationwide requirements. MYOB Exo is now a market leading product for small to medium-sized businesses in New Zealand and Australia. Thousands of copies have been sold on both sides of the Tasman through an extensive channel of sales & support partners. It was developed in Australasia for New Zealand and Australian conditions and offers excellent functionality and value for money.